Jinfushan Scenic Spot is part of the Tentative list of China in order to qualify for inclusion in the World Heritage List. Jinfo Mountain (Golden Buddha Mountain) is a short train/bus ride away from Chongqing. As it is rather famous in the region there are many tourists coming here and it is easy to blend in with the crowds. It boasts karst gorges, stone forests and caves, with the latter being the most attractive to mainland tourists. There are also a few Buddha caves which the mountain is named after but they are more like caves with shrines inside. From the southern entrance after taking the ropeway up there is a very flat well-built plank walk along the cliff side. This is very enjoyable. You can see caves along the way and one cave can take you through the cliff to the road from where you can take the bus back to the entrance. As this is a little too fast to explore the area I recommend you also go through the cave (most tourists want to see the cave as pointed out already) and then from the cave exit on the other side take the plank road again along the cliff side to the start of ascending the mountain. Going up the mountain is a little tougher but does not take too long either. Once at the top I hardly saw people and the birds become less shy. It is possible to see the stone forests from this walk down the other side. From the end of the path you can continue down to the ropeway station or wait for a bus (ticket not included?). It is only 15min back to the station and I figured all the buses will be full from the cave side anyway. I didn't even see a bus pass the time I walked down. In total the round trip should take between 3 and 4 hours. You can also go beyond the main area up to the wind ridge but I did not explore that way. Overall a nice but not amazing half-day tour. 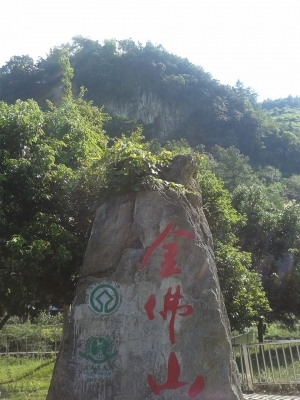 The park entrance rock boasts a UNESCO World Heritage Site inscription with a date from 2014 which it received as part of the Karst of Southern Chin extension, thus the actual inscription it is still seeking would be for flora and fauna unique to the area. For that unfortunately you don't see so much when sticking to the path.